Seth really loves this recipe from The Vegan Table and I do too. 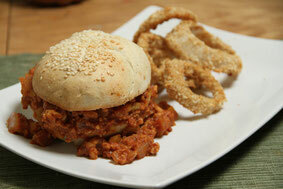 They were the first vegan Sloppy Joes we ever made, and they remain our favorite recipe. They’re made with tempeh, which is steamed and crumbled, along with bell pepper, onions, tomato sauce and seasonings. That really is all that’s in there, so they make a great weeknight dinner. We don’t have kids, but I imagine these are really kid friendly, especially if you leave out the hot sauce (unless your kids like the spicy). We had a couple of buns from Dough Bakery in the freezer, so I thawed a couple of those out and toasted them – they are so good. Dough bakes these every Friday, so if you live in Atlanta, stop by and get a bag of them for your burgers, sandwiches and Joes. Normally we make potato wedges to go with the Sloppy Joes. They’re really easy to make – I just coat them in a little olive oil and sprinkle smoked paprika, oregano, garlic salt & pepper on them then bake at 400 for about 30-35 minutes, flipping them over about halfway through. This time, though, I made some onion rings. We love the OMG Baked Onion Rings recipe from our favorite book, Appetite for Reduction. They take a minute to make, but are soooo worth it. Oh, and while we like tempeh for the Sloppy Joes, if you’re anti-soy or legit allergic to it, this recipe for a lentil version is really good too, it’s just crazy messy so open-faced and eaten with a fork & knife is the way to go with those.